Once upon a time in a meeting/conference/board room far, far away people sat bored staring at yet another presentation on something or another. Sensing that his audience was fading fast (snoring in some cases) he took out his Lightsaber laser pointer and cut the whiteboard in half to wake his attendees up. Okay maybe skip the whiteboard cutting part but apart from that you can get Lightsaber laser pointers. They only come in Sith red but that makes perfect sense because otherwise you'd never be able to see what they're pointing out. You Lightsaber laser pointer can be the hilt of either Darth Vader or Darth Mauls saber and there cool little replicas are about 1/3 scale of the original movie props. NB If you do get fired mor reprimanded for making "Zzzzzheowwwwwwmmm" lightsaber noises during meetings it's not our fault. Cool? 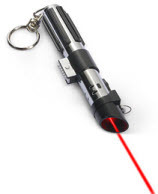 You're just a click away from owning your very own Lightsaber Laser Pointer!